Fixing an oopsie! 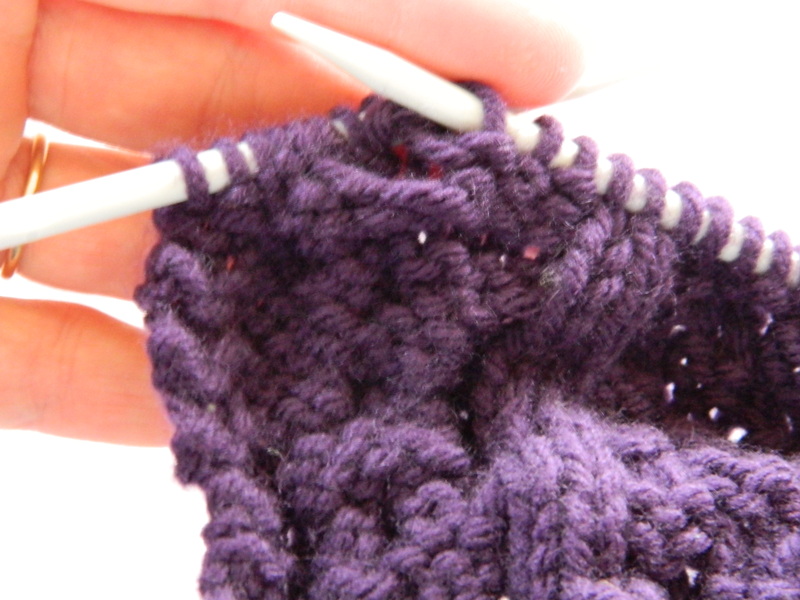 Cable Stitch Crossed Wrong – That's StitchTastic! Yesterday my girls and I were pretty antsy, and the weather was making for a very warm and beautiful day (albeit pretty windy) so we put up our school books and headed to the park. Naturally I grabbed my knitting bag and a blanket for me. After a short walk I found a nice comfy spot in the sun that gave me the full view of the park, and let the kids run a-muck exploring and finding things to put in their nature notebooks. My kids were so happy to be released from the books for a few extra hours and were enjoying themselves running wild, like they were getting their energy from the wind. I sat contentedly knitting on my Cabled Scarf, going by the feel of the yarn and the stitches in my fingers, and paying attention mostly to my little chicklets. At the finish of this row I looked down to check my work and that is when I saw I had made an oopsie. On the cable row I had just worked, I had crossed the cable on the right hand side wrong. The first three stitches should have been crossed in front to make the braid, instead of in back. It probably is not that noticable of a mistake, and I could have gone on to finish the scarf, give it as a gift, and the wearer would probably never know. But I would know the mistake was there and it would bug me to just leave it. So I had to fix it. And I’m going to show you how I did it incase you ever need to fix a cable that has been crossed wrong in any of your projects. If you have a cable that is crossed wrong in the midst of a row, it can be a little challenge to get to. You have 3 choices. 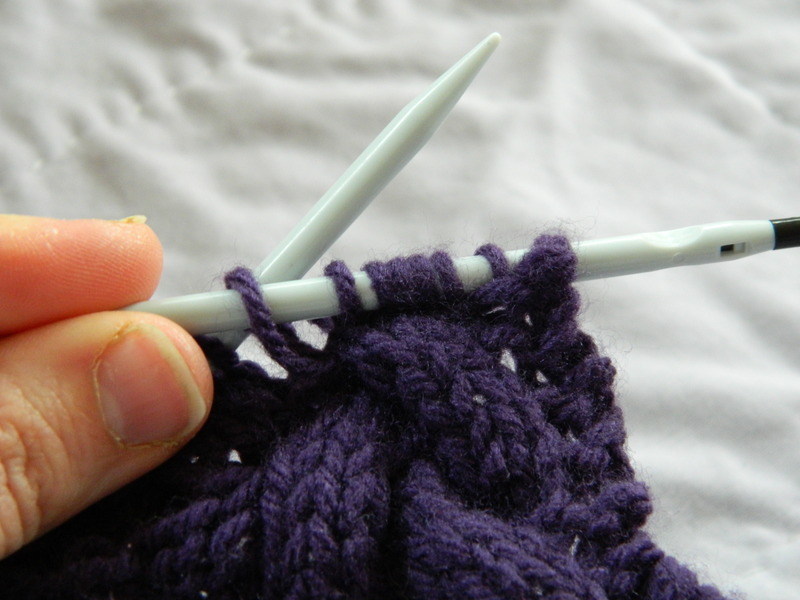 1) Un-knit the row till you undo the mess up, redo it, and finish knitting the row again. 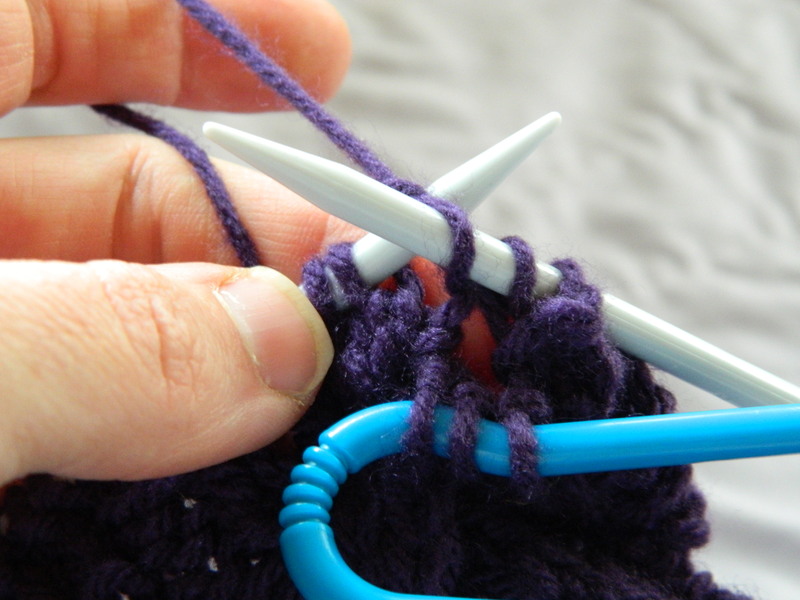 2) Turn the work and Knit the next row to the point of where the mess up is, undo the mixed up cable, fix it, and finish knitting the new row. 3) Stop there and fix it on the current row. This is what I did. 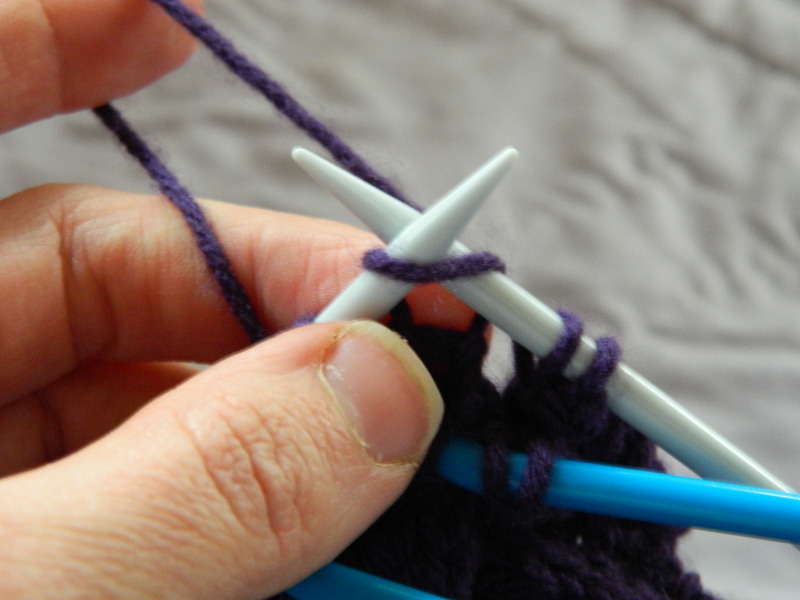 I was knitting on circular needles, so this was the simplest way to fix it for me. 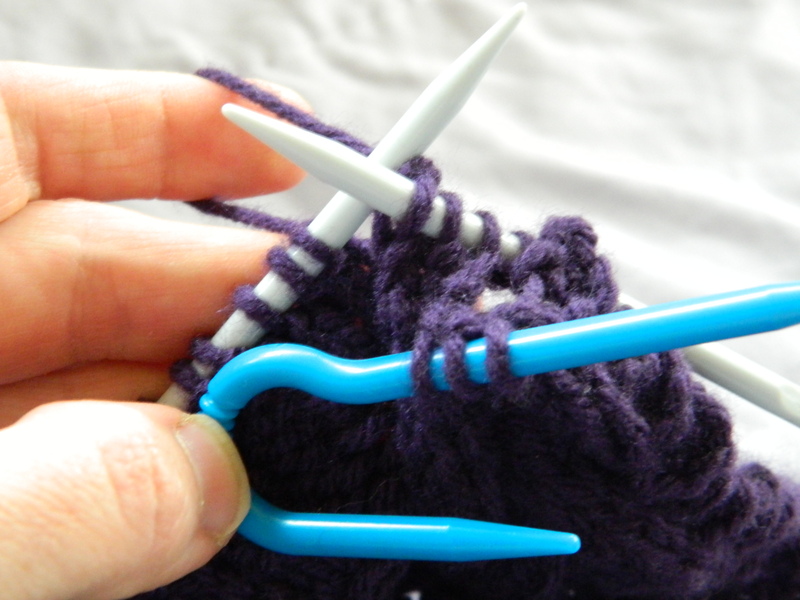 The first thing I did was pushed the row to the opposite needle tip of the circulars. 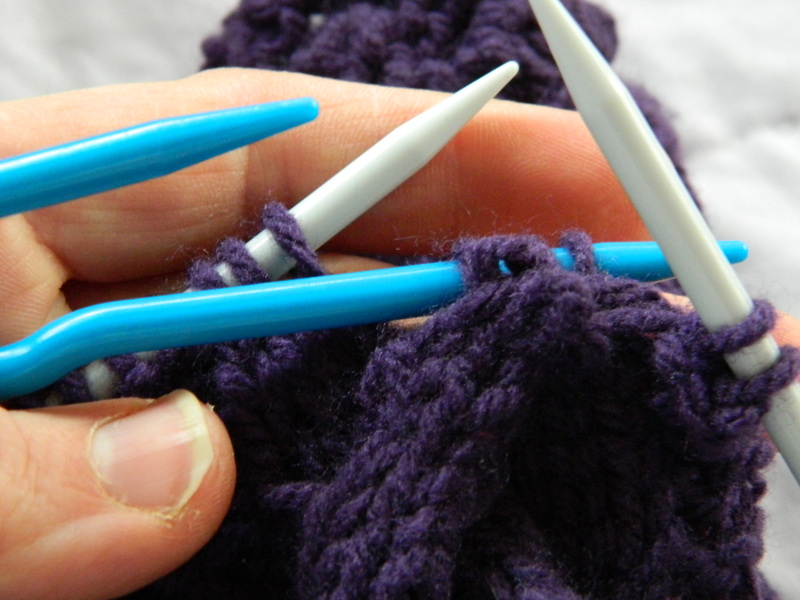 This is one reason I love knitting on circulars. They really do make it easier to fix mistakes. 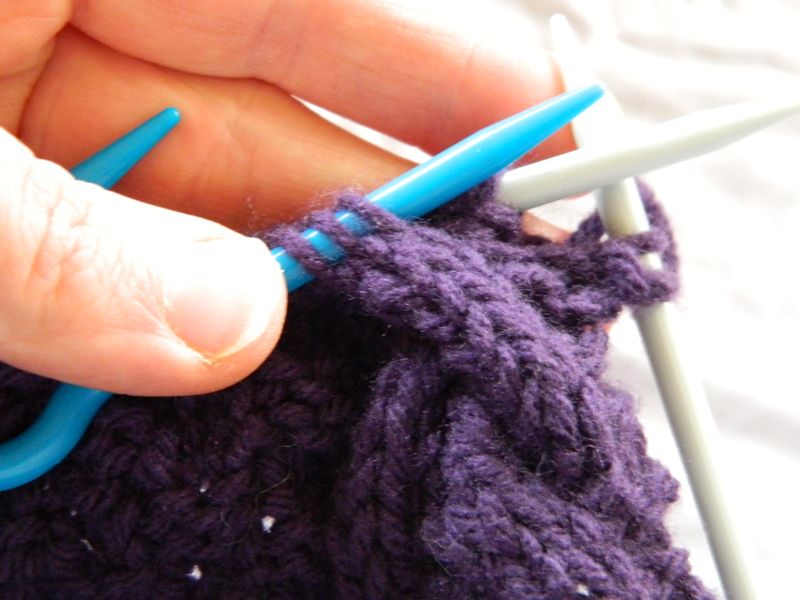 Then with the other needle tip, I picked up the stitches to the point of where the mixed up cable began. In this case, only 2 stitches. 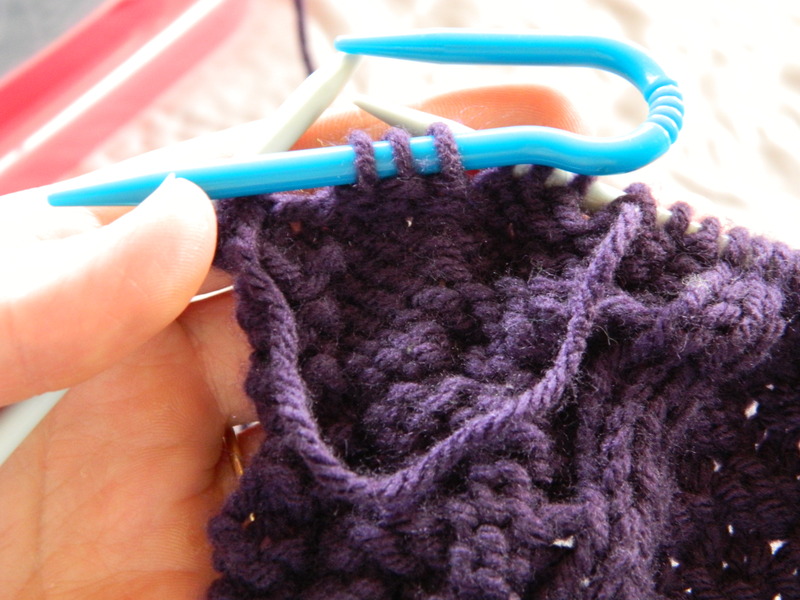 Then I slid the cabled stitches off the needle, in this case the next 6 stitches. 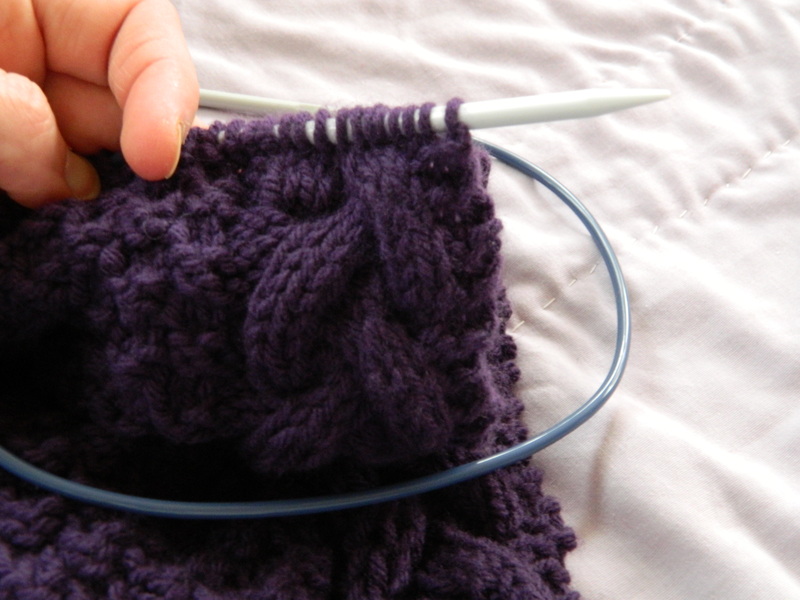 Then I picked out the loop of the 3 back cross stitches and picked up the stitches on the cable needle. 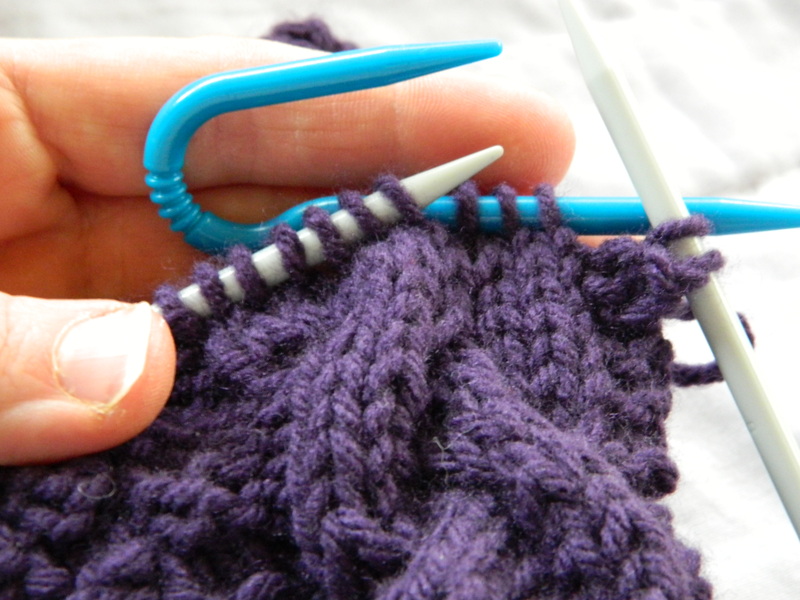 Then with the left hand needle tip, I picked the loops out of the other 3 live stitches and put them on the left needle tip. Here is the view of the back to show how the strand from the previous row has been picked out of the six stitches and left to hang out in the back till we need it again. Don’t worry, we won’t be leaving it hanging long. Next the cable needle was brought to the front so the cable will be crossed correctly. 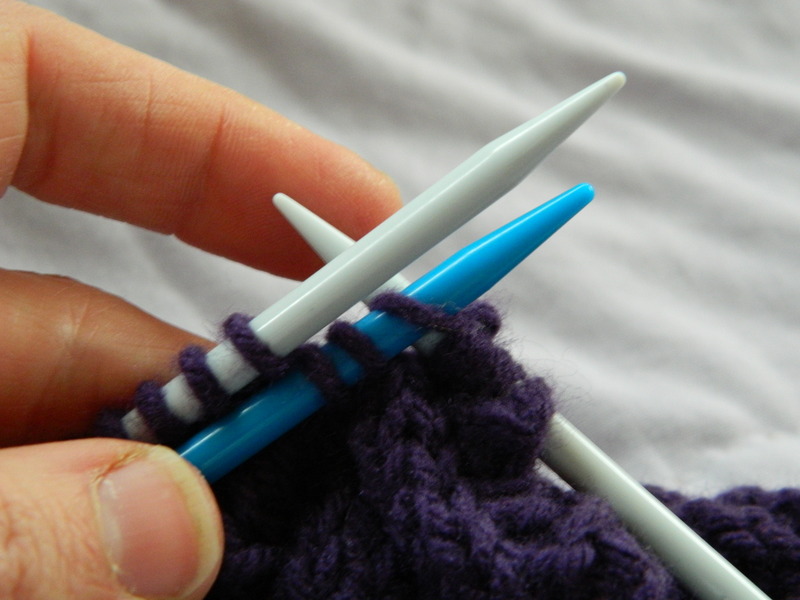 With the right needle tip, I picked up the first stitch on the left needle as to knit like normal. If you notice I picked up the strand that was hanging in the back with my forefinger, like positioning the yarn in Continental Style Knitting. The strand that I left hanging became the working yarn for the next 6 stitches. Then I picked up the working yarn, pulled it through, and completed the stitch. Sliding the old stitch off the left needle, this left one cable stitch worked on the right needle tip, and 2 cable stitches still to be worked on the left needle tip. 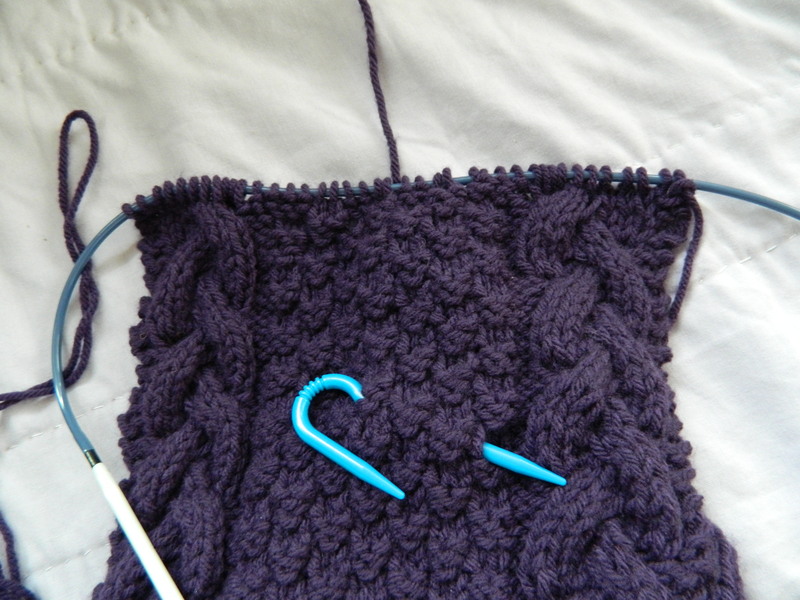 Then I worked the next two cable stitches off the left needle. 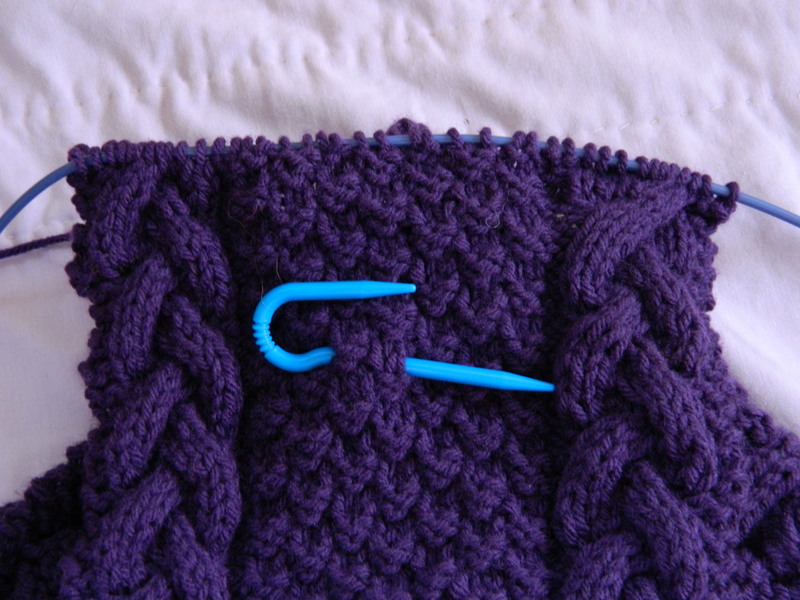 Then I moved the cable needle into position to work the stitches off the cable needle. 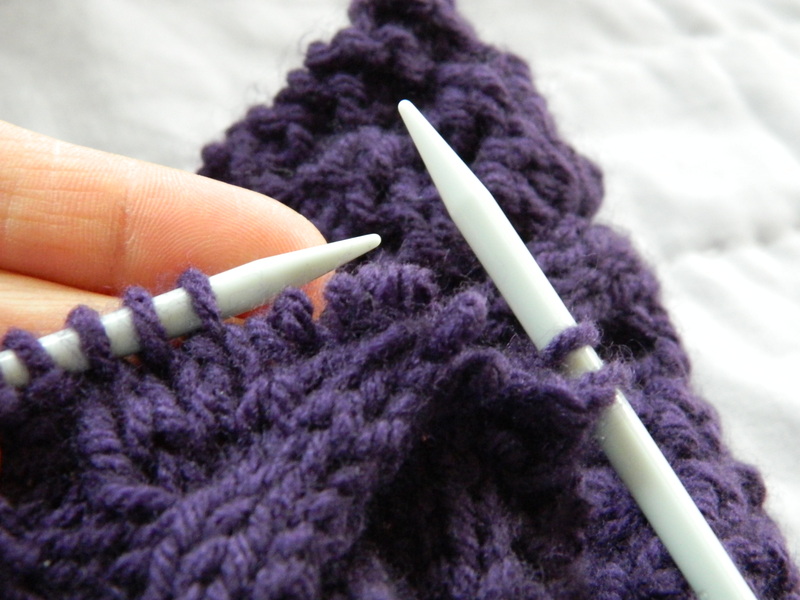 Starting with the first stitch on the cable needle, I knit all 3 stitches off the cable needle as normal. This started getting a little tricky because the working yarn in the back was getting shorter and a more difficult to “catch”. Viola! The cable was fixed! Here is the back view to show how the cable looks from the back and that the strand in back indeed did get re-knit. Here is the front of the work again, with all the stitches being transferred back to the same needle. The cable is crossed correctly, and looks pretty good in my opinion. After knitting the rest of this pattern repeat, the mussed-up-then-fixed cable blends in really well. Hopefully sharing how I fixed this oopsie will help you at some point down the road when/if you ever need to fix an oopsie of your own. Until next time, have a StitchTastic Day! 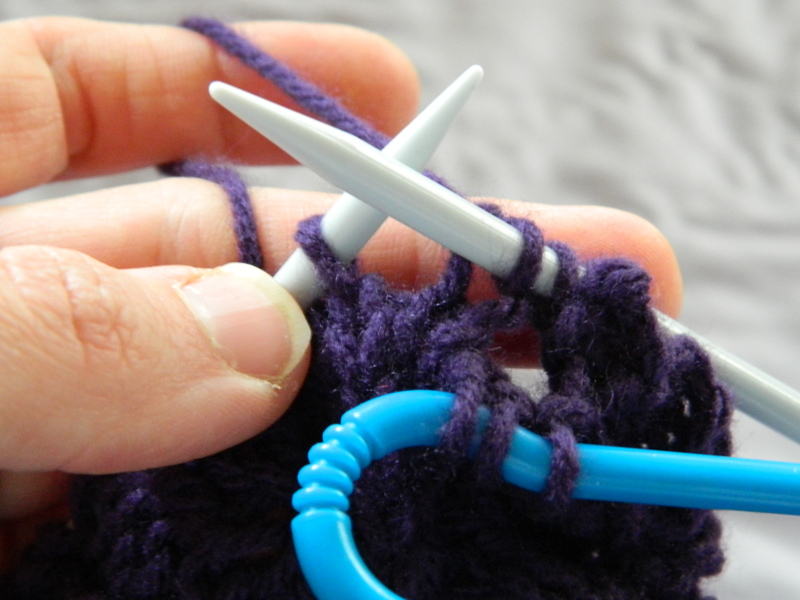 Pingback: Lifelines – Saving Knitting Projects and Knitters’ Sanity Around the World « That's StitchTastic!